Nuvo-6000, a cost-effective fanless box-pc based on latest Intel® 6th-Gen Skylake platform. 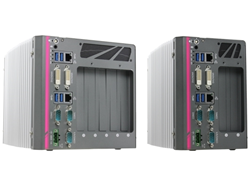 Neousys Technology, a global provider of rugged computer platform, has announced the release of Nuvo-6000 series, a cost-effective, fanless box-pc based on latest Intel® 6th-Gen Skylake platform. It has 5 PCIe/PCI slots to provide the same level of expandability as traditional IPCs, while its fanless design offers superior reliability in all circumstances. Powered by Intel® 6th-Gen LGA1151 socket-type CPU, Nuvo-6000 series delivers up to 30% CPU performance improvement over former CPU generations. It features front-accessible I/O, such as GbE, USB 3.0 and COM ports, for general industrial usage. And the combination of x16 PCIe, x8 PCIe and PCI slots allows the installation of sophisticated add-on cards for high-end vision and motion applications. “With the rise of Industry 4.0, manufacture’s demand of versatile and reliable computer platform has significantly increased. The introduction of Nuvo-6000 series exhibits a new horizon of industrial computer -- a compact, fanless construction offering the same computing power and expandability as conventional IPC, and the most important of all, at the same price range. We believe Nuvo-6000 can help our customers to build a more reliable and durable system while maintaining the same TCO in most demanding industrial applications,” said Chris Ni, Product Director of Neousys Technology. Neousys Technology Inc., established in 2010, designs and manufactures rugged embedded platforms and modules. With the core expertise ranging from embedded computing to data acquisition and processing, our goal is to innovate and integrate feature sets into products for various vertical markets with simple yet elegant architecture.